With the resurgence of Lisa Frankopens a new window, the abundance of “Unicorn”-flavoredopens a new window foods and beverages, and the incorporation of unicorns into pop culture, some might say these magical one-horned horse creatures are having a moment. I’d argue, however, that unicorns have staying power — and have been capturing human fascination since Ancient Greece. January 11th is your chance to celebrate these mystical creatures as it is World Unicorn Appreciation Dayopens a new window! San Mateo County Libraries has books, graphic novels, movies, and more to help you get ready. The earliest description of a unicorn was by the historian Ctesiasopens a new window (c. 400 BCE) who described a wild donkey from India, a creature about the size of a horse with a white body, a purple head, and blue eyes. It had a long multi-color horn protruding from its head and those who were lucky enough to drink from its horn, were protected from all kinds of maladies. The single-horned creature was elusive, however, and difficult to capture. 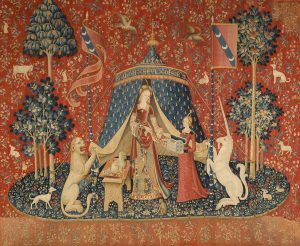 "The Lady and the Unicorn" tapestry. In the 11th and 12th century, unicorns made frequent appearances in bestiaries and illuminated manuscripts. They also became symbols in Christianity, symbolizing both God and the enemies of God. Sometimes the unicorn symbolized the sanctuary offered by the church, which is why you often see unicorns being hunted. One of the most famous depictions of the unicorn was created around 1500 in the form of six tapestries. Known as “The Lady and the Unicorn,” the tapestries are thought to represent the five senses. The Unicorn is shown as a protector of the Lady, staying close by her side. In modern depictions, the unicorn has many of the same traits as those from the past. In Peter Beagle’s classic fantasy novel turned animated film, The Last Unicorn, the protagonist unicorn has healing powers through her horn. In the Harry Potter series, Lord Voldemort slaughters a unicorn (the horror 😮 !) and drinks its blood to revive his strength. You can find these titles and many more unicorn-related tales at San Mateo County Libraries! Learn about the history of unicorn sightings and stories from the famous people who sought them, such as Julius Caesar, Genghis Khan, and Marco Polo. While unicorns currently only exist in our imaginations, narwhals are the real deal. Meet Narwhal, a happy-go-lucky single-horned sea mammal and his sensible pal Jelly the jellyfish. Phoebe navigates the trials of childhood with her self-absorbed but loving imaginary unicorn pal in this graphic novel series. How can a goat compete with a unicorn who can make it rain cupcakes? This unlikely pair finds common ground in this adorable story about friendship and loving yourself. This new edition of The Last Unicorn is actually the first draft of Beagle’s beloved classic. There’s an afterword that recounts the history behind the story as well as personal essays from best-selling authors about the impact of the book. Tracy Chevalier is known for her fictional takes on art history and The Lady and the Unicorn explores the mystery of the eponymous tapestries. What if your food could be as pretty as a unicorn? This e-cookbook teaches you how to make colorful and fun food and drinks that are healthy too. To research the history of unicorns, I used the Gale General OneFile and World History In Context databases. San Mateo County Libraries patrons can access these databases and more from home and in the library! Freeman, L. (2018, September 22). Round the horn A brief history of unicorns by Laura Freeman. Spectator, 338(9917), 38+. Retrieved from this siteopens a new window. Richards, J. (1989). Unicorn. In J. R. Strayer (Ed. ), Dictionary of the Middle Ages. New York, NY: Charles Scribner's Sons. Retrieved from this site. Do you love unicorns? 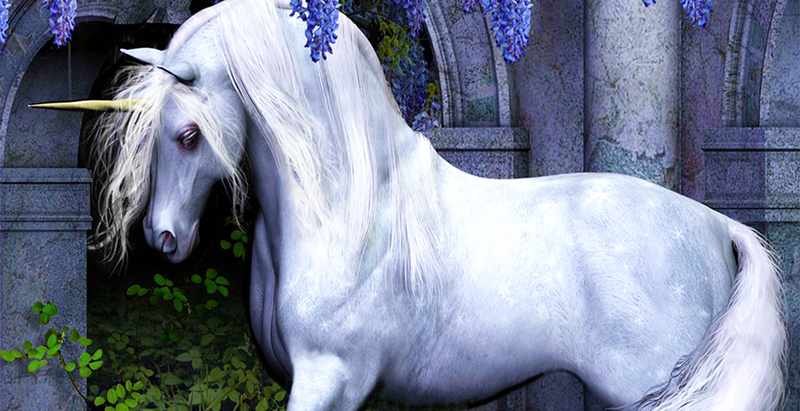 What is your favorite depiction of a unicorn in a book, movie, or work of art? Share below!